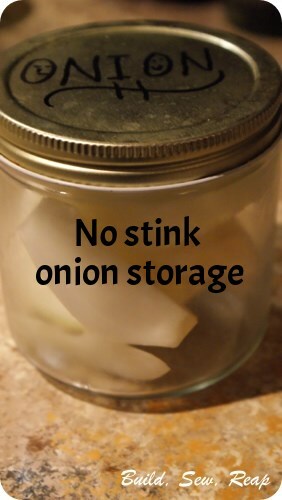 This didn't even seem worth blogging about except that it is one of those things that irritated me until I found a solution so I'm sharing in case the issue of stinky onions in your fridge is bugging you too. Are you ready? This is super simple. If you're not already doing this, you're going to have a major "why didn't I think of that" moment. Put it in a jar. This particular jar was from an extra large container of organic vegetarian Better than Bouillon soup base. It holds almost an entire onion. You shouldn't store uncut onions in the fridge unless you want to make them a bit milder but once they're cut, there's really nothing else to do with them. I cook with onions quite a bit so we always have some in there. I was always irritated by the fact that onions make plasticware stink but the smell can't be contained by plastic bags. The jar solution has been great - no smelly fridge, no wasted onions. Brilliant idea! I'm so doing this! Thanks. Yay! Ok, so it was worth blogging about. :) The more I think of it, the more I think they keep better in there too. I don't find that they dry out as quickly. Mostly though, I love that they aren't stinking up the fridge. When I chop onions for a recipe, I toss them in the jar too so sometimes I'm pleasantly surprised to pull out the jar to start chopping only to find there are some ready to go.